1. Name and location of the property: The property known as the Samuel Younts House is located at 136 Main Street, Pineville, North Carolina. 4. A map depicting the location of the property: This report contains a map depicting the location of the property. 5. Current deed book reference to the property: The most recent deed to the property can be found in Mecklenburg County Deed Book 13423, p. 467. The tax parcel number for the property is 205-014-05. 6. A brief historical sketch of the property: This report contains a brief historical sketch of the property prepared by Lara Ramsey. 7. A brief architectural description of the property: This report contains a brief architectural description of the property prepared by Lara Ramsey. 8. Documentation of why and in what ways the property meets the criteria for designation set forth in N.C.G.S. 160A-400.5. 1. The Samuel Younts House, constructed circa 1873, was the home of Samuel Younts, a successful merchant and one of the founding members of the town of Pineville. In addition to owning and running a general store on Main Street, Younts was also a mule-trader (a lucrative business in Pineville), a cotton-broker, and a money-lender. Younts was listed in the Pineville Town Charter as one of the town’s first commissioners, and the boundaries of the new municipality were drawn one-half mile in each direction from Younts’s store. 2. The Younts House, located along Main Street in Pineville, stands as a physical reflection of a more urban landscape emerging within Mecklenburg’s small towns in the late nineteenth century, with businesses, stores, churches, schools and residences all clustered along a series of streets oriented toward a Main Street (or central thoroughfare). The Younts House was among the first residences built in Pineville and helped to form what, in the years after its construction, would become the center of the town. 3. The Younts House provides a good example of how in-town houses differed from the rural farmhouses that dotted the countryside just around these communities. In addition to the its location along Main Street, the size of the Younts House, its brick construction, and its exterior and interior details (including the elegant Italianate windows and subtle brick detailing) helped to differentiate it from rural homesteads, and even from the more modest houses built within the town. 4. The Younts House not only served as a residence for one of the communities earliest businessmen and leaders, but also as a community hospital. In 1947, the house was converted into a small hospital by Dr. Ralph Reid, a Pineville native and the town’s resident physician. The hospital remained in operation under Dr. Reid until 1967.
b. Integrity of design, workmanship, materials, feeling, and association. The Commission contends that the architectural description prepared by Lara Ramsey demonstrates that the Samuel Younts House meets this criterion. 9. Ad Valorem Tax Appraisal: The Commission is aware that designation would allow the owner to apply for an automatic deferral of 50% of the Ad Valorem taxes on all or any portion of the property that becomes a designated “historic landmark.” The current appraised value of the house is $210,900.00. The appraised value of the .63-acre lot is $329,300.00. The Samuel Younts House, located at 136 Main Street in the town of Pineville, is a structure that possesses local historic significance as one of the earliest residences in Pineville and as the home of Samuel Younts, a successful merchant and one of the founding members of the town. Constructed c. 1873, the Younts House stands as an early indication of a residential element emerging within the small towns of Mecklenburg County toward the end of the nineteenth century. The period following the Civil War was one of tremendous growth for Mecklenburg County, and this growth translated into the creation and expansion of its small towns. Fueled by the new cotton economy, these towns grew from sparsely populated outposts into thriving communities, each with its own businesses, churches and schools. Pineville was among Mecklenburg’s expanding Reconstruction-era towns. Incorporated as an independent municipality in 1873, Pineville began as a small stagecoach stop called Morrow’s Turnout. With the construction of the Charlotte & South Carolina Railway in 1852, Pineville became part of the expanding network of cities and towns within the county and the state that were connected by rail. Although still considered small and largely rural when compared to urban centers like Charlotte, Pineville and other Mecklenburg County towns offered close and convenient places for farmers to bring crops and for families to come together to worship, buy goods, and socialize with neighbors. The impressive two-story brick house that Samuel Younts built for his family on Main Street remains today as both an indication of Younts’s position within Pineville’s newly-established merchant class and as a reflection of the town’s emerging layout, with businesses, stores, churches, schools and residences all clustered along a series of streets oriented toward Main Street, the central thoroughfare. The Younts House was among the first residences built in town and helped to form what, in the years after its construction, would become the center of Pineville. Although the basic form of the Samuel Younts house is not that far removed from the more traditional rural farmhouses scattered throughout Mecklenburg County, its location on Pineville’s Main Street, its size, its brick construction and architectural details help to distinguish it as a town residence. As Mecklenburg’s small towns expanded, a distinctive landscape began to emerge within them, combining elements of both city and rural life. Each town comprised a main street almost always oriented to the local railroad. General stores, grocers, banks, drug stores and post offices lined this street, making up a modest commercial district usually no more than one block long. Small industries, including corn and flour mills and livery stables, were often placed behind the more prominent businesses along the street.8 Branching from this commercial core were several residential streets, creating a small version of the “uptown” neighborhoods found in larger cities. Often, the first residents within the town were those people—large farmers, merchants, and business owners—who presided over most of the town’s commercial activity. Placed among this commercial and residential mix were the community’s churches and, later, schools. Although clearly influenced by the physical layouts of cities like Charlotte, these towns were still rural at heart. Dr. Richard Mattson, in his essay on small towns in Mecklenburg County, notes that: “The countryside eased into town in the late nineteenth and early twentieth centuries, as farms and woodland rolled along behind town lots.” The county’s towns “were settled primarily by rural folk, and traditional farmhouse designs often occupied parcels broad enough for flourishing kitchen gardens, smokehouses, and other assorted outbuildings. Street patterns also reflected rural precedents.”9 All of these features, rural and urban, came together to form a common geography for all of Mecklenburg’s small towns. The success of Pineville and other small towns like it was due in large part to the entrepreneurship of a new and shrewd group of businessmen, all eager to take advantage of every opportunity afforded them in these new outposts. These men owned and ran general stores, were involved in cotton brokering, mule trading, banking, and a host of other business activities. Many were also involved in local politics and were active members of local churches. In many ways, Mecklenburg’s businessmen helped to shape their towns as much as the railroads did. Given Samuel Younts’s prominent position within the town of Pineville, it is not surprising that he chose to build his home in the heart of the newly incorporated community. Around 1873, Younts erected a two-story brick house on a portion of his landholdings along the north side of Main Street.23 Its location along Pineville’s main commercial thoroughfare was not the only feature of the house that set it apart from the farmhouses that surrounded the town’s small center. The size of the house, the brick construction, and the exterior and interior detailing helped to differentiate it from those more modest homesteads, and even from the other houses built within the town. In the 1860s and 1870s, traditional housing forms still dominated residential construction within the county. In rural areas, the most common form remained the I-house, a simple side-gable structure that was usually one room deep. Even those homes built by wealthy farmers or town-dwellers tended to retain the I-house form or to adopt simple variations like the gable-front-and-wing. The form of Samuel Younts’s new house, a gable-front-and-wing with gabled rear ell, was more complex than the ubiquitous I-house, but was relatively reserved when compared to the more irregular plans of the Queen Anne style homes that would be built in towns like Matthews and Cornelius in the next two decades.24 Like many homeowners, Samuel Younts attempted to ‘dress up’ his house with more ornate exterior detailing. Most of these details were Italianate, including segmented arch windows, decorative brickwork, and a large shed-roof front porch. The 2/2, segmented arch windows, with their large panes of glass, were a definite departure from the usual farmhouse windows, and the simple brick work over the windows added another level of decoration to the fenestration. The woodwork on the front porch and under the eaves of the house were elaborate, and, given the new methods of mass-producing building materials, were probably machine-made.25 Inside the Younts House, the expansive center stair hall, with its high ceilings and impressive staircase with simple yet elegant rounded hand rail and turned balusters, continued the feeling of luxury displayed on the house’s exterior. In 1947, the house was purchased by Dr. Ralph Reid, Pineville’s resident physician. Reid, a Pineville native and graduate of Columbia University’s School of Medicine, first opened a small practice above the Pineville Drug Company in 1944. Dr. Reid soon outgrew the small space and, intending to expand his practice even further, bought the large brick house on Main Street and converted it into a small community hospital.33 Reid used the front parlor on the first floor as his office, and reconfigured the upstairs bedrooms into examination rooms. These examination rooms, as well as the remaining rooms downstairs, were also used for overnight patients.34 Dr. Reid, who had been chief resident at Charlotte Memorial Hospital from 1942 to 1944 and still performed surgeries there, would often make his rounds in Charlotte in the early morning before coming back to the hospital in Pineville, remaining there until late into the night. Joe Griffin, a local historian, recalls that “many surgeries were performed here and hundreds of babies delivered. Dr. Reid probably delivered more babies in Pineville than any other doctor. I’m sure he delivered two generations in many families. . .”35 The hospital remained in operation under Dr. Reid until 1967. Reid continued to practice medicine in Pineville until his death in 1979.36 After serving as a rental property for ten years, the Younts House was sold by Dr. Reid’s widow and was, like so many other buildings on Main Street, converted into an antiques shop. The Younts House is currently occupied by Blis Salon and owned by its proprietor, Tami Curtin. The Samuel Younts House is located at 136 Main Street within the town of Pineville in southern Mecklenburg County. The house sits on a .63-acre lot on the north side of the street, facing south. To the east of the house is a small one-story brick building. A modern one-story brick office building sits on the lot to the west of the house.37 The area of the property to the east of the house has been paved in to provide a parking lot for the building, and the entire parcel is surrounded by a wrought-iron fence with brick posts. The Younts House is a two story modification of the gable-front-and-wing form, with a two-story gabled ell projecting from the rear of the wing. The front gable, approximately one bay wide and two bays deep, extends only slightly past the side-gable wing (two bays wide and one bay deep). The rear gable ell adjoining the front wing is linked to the front gable by a hip-roof connection, creating a more box-like plan and complex roofline than is seen on the typical gable-front-and-wing form. The exterior walls of the house are constructed of brick and faced with running bond. The brick has been painted a light grey. The multiple roofline is punctuated by two interior chimneys and covered with slate shingles in a variegated pattern, with the exception of the north slope of the side gable wing, which has been covered with corrugated metal. A series of one-story brick additions project from the rear of the main structure; according to Tom Eubanks, the house originally had a shed-roof rear kitchen addition that connected to the main house through the door on the back wall of the stair hall. The additions that are presently on the house were probably added by Dr. Reid and subsequent owners. 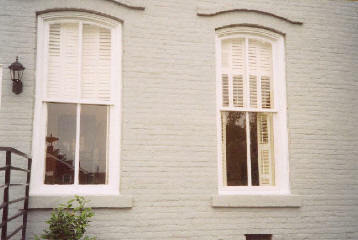 Several architectural details on the exterior are Italianate, a building style that was more commonly used in commercial buildings in the area.38 Windows on the original portion of the house are double hung units topped with a segmented arch. Each sash is divided into two large lights with a thin vertical muntin. Above many of the windows is a gently curving brick crown mirroring the shape of the segmented arch. On portions of the east, south (façade) and west elevations, a narrow brick stringcourse runs just above the second floor windows, curving over the segmented arches. Ornamental bargeboard (a popular decoration from the Queen Anne style) originally lined the front gable on the façade. This decoration was removed when Dr. Reid converted the house to a hospital, along with the shed roof front porch that extended across the façade. The porch was replaced by an enclosed brick entrance, which was probably considered more appropriate for the new use of the building. Other alterations to the exterior include a handicap ramp leading to a door that has been built into the east elevation and a fire escape leading to a door fashioned from a second-story window opening on the west elevation. 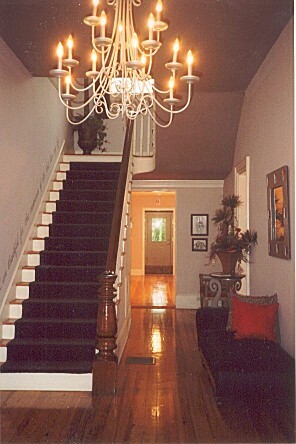 The main entrance of the Younts House leads directly into a spacious central stair hall. The half-pace stair is placed in the back of the room, with the first run of the stair rising along the west wall of the room. The substantial yet elegant newel post connects to a rounded stair rail. Two delicate balusters are placed along each tread of the staircase, and simple brackets decorate the side of the stair wall. The simple baseboards, door surrounds, high ceilings and wide-plank wood flooring seen in the stair hall continue throughout the downstairs rooms comprising the original house. The room located in the southwest corner of the first floor also contains one of two remaining fire place mantles in the house, which is flanked by two bookcases. A doorway on the north wall of the stair hall leads into the shed-roof addition, which has recently been remodeled after a fire. From that addition, one can access the other additions to the house. The second run of the stair continues up to a central room on the second floor. Originally, four rooms opened onto this central room; the arrangement of rooms was first altered by Dr. Reid to better facilitate the activities of the hospital. Two doors on the east wall of the central room open into small antechambers, each leading into a small room. 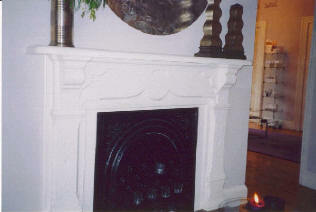 One of these rooms, located in the northeast corner of the house, contains a fireplace mantle ornamented with simple scrollwork, organic, rounded shapes, and trefoil. On the west side of the second floor, there is a room in the southwest corner, a bathroom to the north of this room, and, to the north of the bathroom, a small hallway running to the west wall of the house. This hallway has two doors along its north wall leading into two small spaces divided by a partition wall. This wall runs up to a window on the house’s north wall, but does not disturb it. . 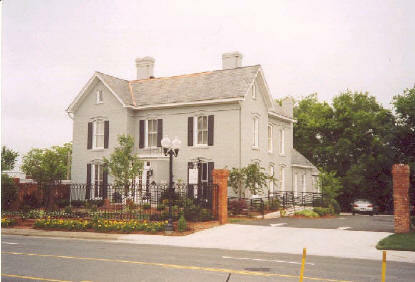 Despite the alterations that have been made to it over the years, the Samuel Younts House stands as a testament to the prosperity and importance of one of Pineville’s first and wealthiest merchants, and as an example of the burgeoning small town landscape within Mecklenburg County in the late nineteenth century. The house has evolved to fit the changing community, serving first as an imposing residence for one of its founders, then as a hospital for all of its citizens, and later as a commercial property catering to shoppers drawn to Main Street for its charming collection of antique stores. The Younts House remains, after more than 120 years, an important part of Pineville’s architectural and social history. 1 Richard L. Mattson, “Historic Landscapes of Mecklenburg County: The Small Towns,” July 1991 <Small Towns of Mecklenburg County> (July 28, 2003), Chapter 1 (“Rise of the Small Towns”). 2 Joe H. Griffin, “Who was Samuel Younts?” (portion of unpublished manuscript provided by Mr. Griffin), 1; Joe H. Griffin, interview by author, Pineville, North Carolina, 17 July 2003. 4 Sherry J. Joines and Dr. Dan L. Morrill. “Historic Rural Resources in Mecklenburg County, North Carolina” <http://www.cmhpf.org/surveyruralcontext.htm> (28 July 2003), Ante-bellum Period. 5 LeGette Blythe and Charles R. Brockman, Hornet’s Nest: The Story of Charlotte and Mecklenburg County (Charlotte: McNally of Charlotte, 1961), 259-262. 6 Joines and Morrill, Reconstruction Era. 7 Blythe and Brockman, 417-422. 8 Mattson, chapter 2 (“Main Streets”). 10 Joe H. Griffin, My Hometown—Pineville: History, Hearsay, Memories & Scrapbook of Pineville (Pineville, NC: J. H. Griffin, 2001), 8. 12 Levi Branson (ed. ), North Carolina Business Directory, 1872-1878, vol. 1 (Raleigh, NC: Nichols and Gorman, 1872), 144-145; Levi Branson, North Carolina Business Directory, 1872-1878, vol. 5 (Raleigh, NC: Nichols and Gorman, 1878), 192-193. 13 “Merchants and Tradesmen in Mecklenburg County in 1884. . .As Recorded in the Branson County Directory,” Olde Mecklenburg Genealogical Society Quarterly 17, no. 2 (1999), 20-23. 14 Mattson, chapter 1 (“Rise of the Small Towns”). 16 U.S. Census, North Carolina, Mecklenburg County, 1860, p. 59-60. 18 Mecklenburg County Deed Book 84, page 333. 19 “Pineville Has Been Important Area of Mecklenburg Since Its Founding,” Charlotte Observer, 28 February 1950 (vertical file, “Mecklenburg Co. Towns—Pineville,” Robinson-Spangler Carolina Room, Main Branch, Mecklenburg County Public Libraries). 20 Tom Eubanks, telephone interview by author, 13 August 2003. 22 “Who was Samuel Younts?”, 1; Griffin , interview. 22 “Who was Samuel Younts?”, 1; “Renovations Being Made to Historic Reid Building,” (name and date of newspaper unknown; given to author by Tami Curtin) Although the chain of title breaks down with the will of Barbara Younts (dated 1905), the lot on which the house was built was almost certainly part of a larger parcel along Main Street purchased by Samuel in 1868 from B. F. Morrow (Mecklenburg County Deed Book 6, page 566). The exact year that the house was constructed in not known, and the year 1873, which appears in several newspaper articles about the house, was probably taken from the date of the town’s charter, in which Samuel Younts’ store on Main Street is mentioned. 25 Catherine W. Bishir, et al., Architects and Builders in North Carolina: A History of the Practice of Building (Chapel Hill: University of North Carolina Press, 1990), 219-226. 26 U.S. Census, North Carolina, Mecklenburg County, 1900, p.
27 Blythe and Brockman, 450. 28 Mecklenburg County Will Book, page 485. 29 “Paul R. Younts, Man of the Year,” Charlotte News, 30 December 1961 (article provided by Joe Griffin). 32 Mecklenburg County Deed Book 1132 Page 528. 33 “Doctor to a Generation of Pineville Residents,” Charlotte Observer, 10 April 1979, 6A. 36 “Doctor to a Generation of Pineville Residents,” 6A. 37 This lot originally contained a frame barn owned by the Younts family. This entry was posted in Survey & Research Reports, Uncategorized.